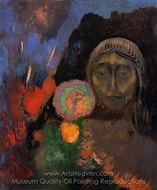 Odilon Redon was a Symbolist painter, born in Bordeaux, Aquitaine, France. 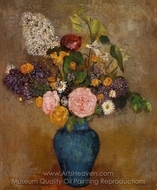 Redon started drawing as a young child, and at the age of 10 he was awarded a drawing prize at school. At age 15, he began formal study in drawing but on the insistence of his father he switched to architecture. 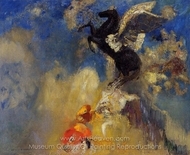 His failure to pass the entrance exams at Paris� �cole des Beaux-Arts ended any plans for a career as an architect, although he would later study there under Jean-Leon Gerome. Back home in his native Bordeaux, he took up sculpture, and Rodolphe Bresdin instructed him in etching and lithography. 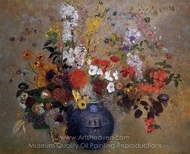 However, his artistic career was interrupted in 1870 when he joined the army to serve in the Franco-Prussian War. 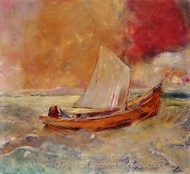 At the end of the war, he moved to Paris, working almost exclusively in charcoal and lithography. 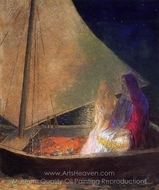 It would not be until 1878 that his work gained any recognition with Guardian Spirit of the Waters, and he published his first album of lithographs, titled Dans le R�ve, in 1879. 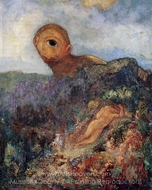 Still, Odilon Redon remained relatively unknown until the appearance in 1884 of a cult novel by Joris-Karl Huysmans titled, A rebours (Against Nature). 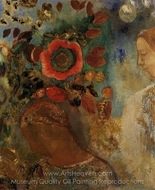 The story featured a decadent aristocrat who collected Redon's drawings. 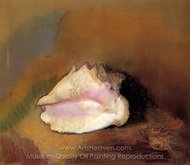 In the 1890s, he began to use pastel and oils, which dominated his works for the rest of his life. 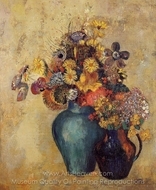 In 1899, he exhibited with the Nabis at Durand-Ruel's. His popularity increased when a catalogue of etchings and lithographs was published by Andr� Mellerio in 1913 and that same year, he was given the largest single representation at the New York Armory Show. 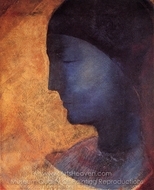 In 2005 The Museum of Modern Art (New York City) launched an exhibition entitled "Beyond The Visible", a comprehensive overview of Redon's work showcasing more than 100 paintings, drawings, prints and books from The Ian Woodner Family Collection. The exhibition ran from October 30, 2005 to January 23, 2006.